Branches are invited to submit nominations for the Executive Committee. These may be made for the following officers: Chair, Vice-Chair, Secretary, Assistant Secretary, Treasurer, Minute Secretary and for up to 8 other members of the Executive Committee. Motions seeking to change the rules of the Trades Council should be received not later than Saturday 17 November. Nominations and motions must be submitted in writing to the Secretary. 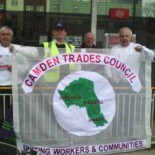 This entry was posted on November 15, 2012 by CAMDEN TRADES COUNCIL.